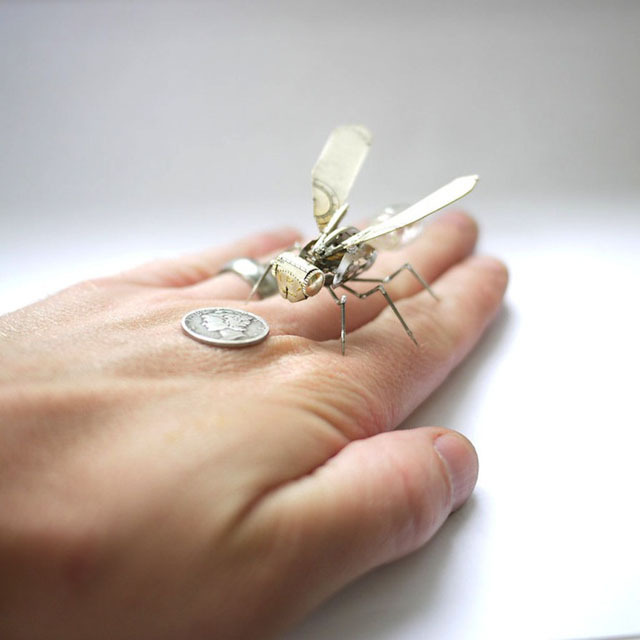 I have really been enjoying the intricacies of miniature sculptures made out of old mechanical parts; be it typewriter pieces, parts of old watches, small lightbulbs or other found objects. The following examples manage to transform the mechanical parts that comprise each piece from cold and sterile objects, to whimsical and playful works of art. Additionally, it is also always great when you see an artist using recycled or found source material. Below are three of my recent favorites. Jeremy Mayer's swallows are made of old typewriter parts and are assembled without glue or soldering. Each piece is assembled using parts that are native to the typewriter and that's it. As icing on the cake, his design even allows for the wings to partially retract. These pieces look so strong to me, it feels as though they can really fly. 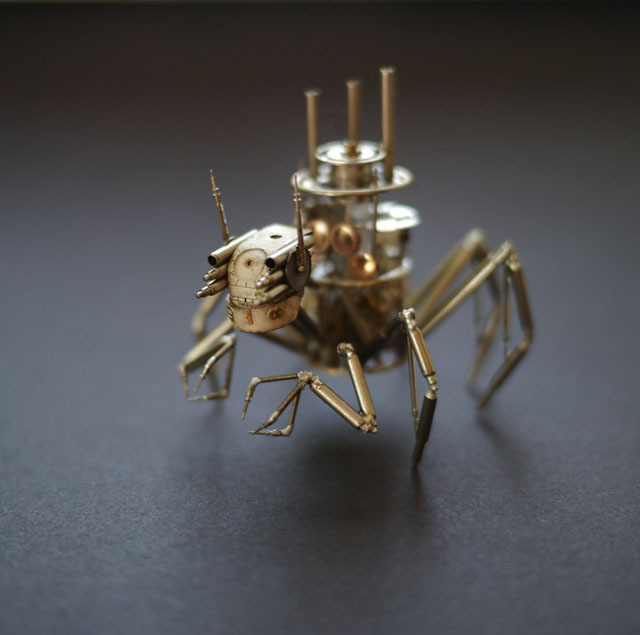 These little mechanical insects are made by the artist Justin Gershenson-Gates using recycled watch parts, light bulbs and other found objects. Each piece is made by hand, and the resulting whimsical assemblies are so interesting. They almost look like they belong in a pixar movie. Sue Beatrice of All Natural Arts creates steampunk watch part sculptures made out of repurposed antique time pieces and other recycled watch parts. As seen below, she assembles the parts into sculptures of animals, humans, and even mythical creatures, such as the sea monster which can be seen below. I am a little obsessed with these pieces. The way they are assembled, so you can see all the moving parts, it really seems as though they could come to life and even serve as some sort of talisman. Do you have any favorite miniature sculptures? via here, here & here.